Rapidly established as the foremost Elton John Tribute Act in the UK, Ultimate Elton, who also plays with a live band, presents an uncannily accurate reproduction of the classic live shows of one of pop music’s most successful and best-loved artists. They made the headlines recently when they performed at Elton John’s Mothers 90th birthday party! 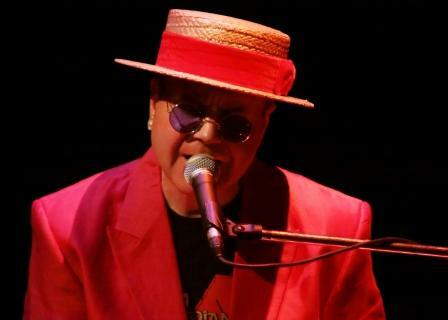 A lifelong Elton John fan, Paul first started singing and performing Elton’s songs whilst studying Performing Arts at University in the early 1980’s. Paul’s career highlights to date include dueting with Kiki Dee on ‘Don’t Go Breaking My Heart’, singing to a packed Wembley Stadium before the Saracens v Harlequins rugby match, and of course meeting Sir Elton in person! Ultimate Elton (and The Rocket Band) is now much in demand at festivals and theatres throughout the UK and beyond. They are certainly one of the top tribute acts working today and this has recently been recognised at the National Tribute Awards, run by the influential ‘Agents Association of Great Britain’, who awarded Ultimate Elton ‘Official UK No. 1’ for 2016.